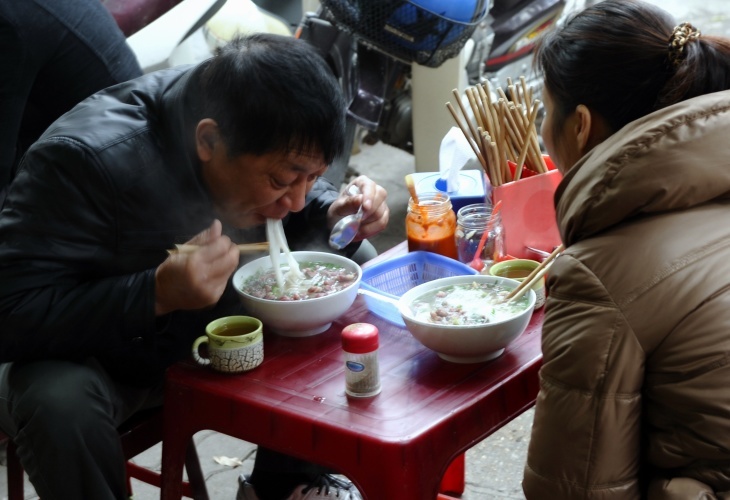 As the national dish of Vietnam and the source of unspeakable joy for millions of empty stomachs around the rest of the world, pho (pronounced "fuh") has seen its popularity skyrocket since arriving in North America in 1975. Consisting of rice noodles in a beef or chicken broth and garnished with cilantro, basil, onions and meat, the dish's origins are far murkier than its crisp, clear broth. While pho is a tribute to the culture and heritage of Vietnam, colonial rule is its not-so-secret ingredient. Prior to French occupation, Vietnamese cuisine was marked by an affinity for pork, seafood and chicken. As locals were tasked with cooking pot-au-feu, a beef stew that's one of the cornerstones of French cuisine, for their masters, red meat began to infiltrate markets and restaurants. That culminated, around the turn of the 20th century, in the introduction of beef-based pho. At least that's one theory. Other people argue it was the Chinese, with their influx of ginger, noodles and anise, who inspired pho. Ambiguous origins aside, this soup has found a home in Southern California, most notably in the Little Saigon area of Westminster and Garden Grove. Don't have the time to head down to Orange County? You'll find plenty of delicious pho in Los Angeles, courtesy of our sizeable Vietnamese-American population. Here are just a few places to get your fix. If cheap eats are your ministry, prepare to come to church. Located on the outskirts of Chinatown, Pho 87 has spent decades delivering spoonfuls of heaven. Options such as oxtail, charbroiled pork, shrimp, brisket and beef ball pho are just the tip of the iceberg. But be warned! With Dodger Stadium around the corner, this place gets busy. Metered parking is plentiful and the restaurant has its own lot. Do yourself a favor and bring cash because they don't take cards. And before you ask, yes, their peanut sauce is addictive. 1019 N. Broadway, Chinatown. 323-227-0758. As Jesus once stated, "Ask and you shall receive." If the question is, "Where's the best spot for pho in DTLA?," you've found the answer. Although Blossom's portions aren't the most generous, the abundance of flavor in their soup is. The restaurant has upscale offshoots in Chinatown, Santa Monica and Silver Lake, but the late hours and proximity to the Regent Theater make the downtown L.A. outpost a standby. As with all things involving the area, parking is not your friend. Exercise your constitutional right to take a bus or a Lyft. 426 S. Main St., Downtown. 213-623-1973. 451 Gin Ling Way, Chinatown. 213-626-8345. 4019 Sunset Blvd., Silver Lake. 323-953-8345. 2821 Ocean Park Blvd., Santa Monica. 424-268-4425. For those fond of East Asian cuisine, San Gabriel Valley boasts an embarrassment of riches. Pho Filet 2, the bigger budget sequel to its predecessor, Pho Filet, is a must. Its signature dish is pho bac — thinly-cut slices of filet mignon bathed in a ginger-infused, cinnamon and clove broth. If you're feeling adventurous, sample delicacies like frog legs or snails sautéed in coconut milk. Since it doesn't close until 11 p.m., you've got plenty of time to feast. Bring cash. 2643 San Gabriel Blvd., Rosemead. 626-280-1899. What this place lacks in signage (it's Moon Juice's bashful neighbor) it makes up for in heart. A Silver Lake staple, Pho Café is known for its lemongrass steak, which you'll find in an assortment of dishes. It adds a unique flair to their bun cha gio thit nuong, consisting of vermicelli rice noodles, egg rolls, peanuts, fresh herbs and the aforementioned steak. Street parking is your friend here, as is cash. Prepare accordingly. 2841 Sunset Blvd., Silver Lake. 213-413-0888. For early risers in need of a fix, Golden Deli, another San Gabriel Valley favorite, will heap blessings onto your soul — and into your bowl — as early as 9:30 a.m. on weekdays. With huge portions, don't be surprised to find lines out the door no matter what time you arrive. Come for the pho, but don't leave without the egg rolls. 815 W. Las Tunas Dr., San Gabriel. 626-308-0803. With its bright hues and vibrant décor, Pho 21 feels more like a coffee shop than a traditional Vietnamese restaurant. 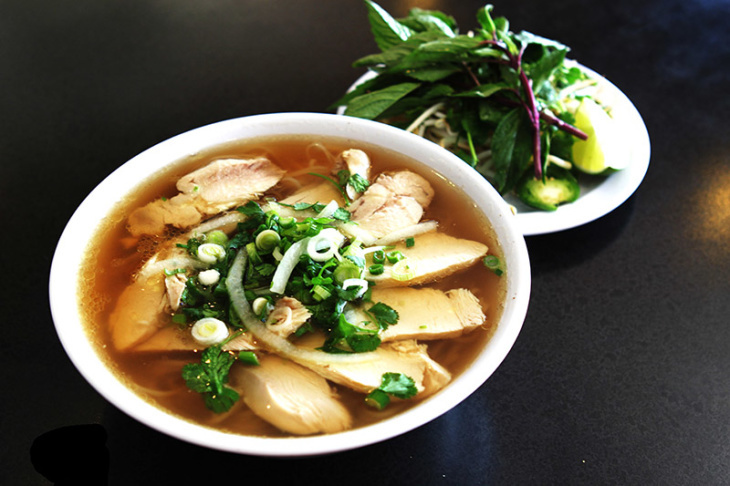 Residents of Canoga Park know the pho tastes as good as it looks. The pho xe lua, a marriage of brisket, rare steak, tendon and tripe, is a foodie's dream. Instead of getting your basil sprigs, bean sprouts and lemon wedges family-style, each bowl of pho comes with its own garnishes. That's reason enough to celebrate. 21525 Sherman Way, Canoga Park. 818-854-6622. Doubling back to DTLA, Little Sister is the brainchild of Tin Vuong, the culinary wunderkind responsible for Abigaile, Wildcraft, Dia de Campo and your inability to put down your fork. He's famous for his anti-fusion forays into food and you can taste it in his broth. The prices at Little Sister are hefty. A bowl of pho costs $13, as opposed to $10 at most of the restaurants on this list. Other irresistible options on the menu include steamed black cod and ma la beef tartare to go with your soup. 523 W. 7th St., downtown L.A. 213-628-3146. Oxtail pho and a pork Banh mi is always a great way to do lunch! With its minimalist aesthetic and approach, Phorage opts for quality over quantity. Although they serve only four types of pho, including a vegan option, each bowl is bursting with firm, delectable rice noodles, shaved white onions and a touch of salt. Their oxtail pho couples cilantro with a hint of sweetness while the meat in their free-range chicken pho is shredded to perfection. Don't ignore the rare beef pho with thin slices of rich, textured meat. If you have any room left, get the imperial rolls and the jidori chicken. 3300 Overland Ave., Palms. 310-876-0910. Koreatown is best known for two things: notoriously atrocious parking and its cornucopia of amazing eats. If you can survive the former, the latter will more than make up for it. Pho 2000's menu features a picture of every item, from the stir-fry beef with egg roll to the seafood fried rice. Your lifetime of getting catfished by food has finally come to an end. While the house special pho with meatballs, rare steak, brisket, tendon and tripe will make your heart sing, the Korean-style oxtail pho is a must. As is standard for many Koreatown establishments, this spot doesn't close until 3 a.m., perfect for ravenous night owls. 215 N. Western Ave., Koreatown. 323-461-5845. You'll be hard pressed to find top-flight Vietnamese food in the Fairfax district. Thankfully, there's Nong La Cafe, which also has a West L.A. location. It takes a new-school approach to pho, fusing traditional Vietnamese flavors with thicker noodles. The pho is lovely. Nong La also makes a killer bun bo hue, a soup with annatto seed oil, anise and lemongrass in the broth. This soup might induce a food coma or at least a food nap. Nong La gets bonus points for serving a wide variety of sake and beer and for having purse hooks under the bar. 145 N. La Brea Ave., Suite B, Fairfax. 323-938-1188. 2055 Sawtelle Blvd., Sawtelle. 310-268-1881.